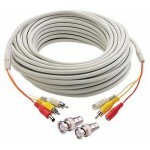 Here we have a list of all the Siamese Cable that we offer for CCTV security cameras. If you don't know what siamese cabling is, please read below. There are 2 types of CCTV video cables. 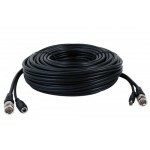 One type called coax cable or RG59 cable is a video cable only; this is a coaxial cable with solid copper core that will let you carry the video signal only from the camera to a DVR recorder or TV Monitor. 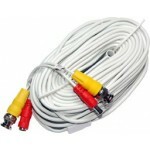 The second type of security camera wire is called Siamese Cable or RG59 Siamese cable. In siamese wire you have the video coax RG59 cable like the one mentioned above, and also another 2 thin wires for power/electricity running next to it. 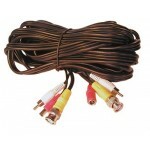 This Siamese cable is the most popular type of camera wire that we sell because it makes camera installation very easy. 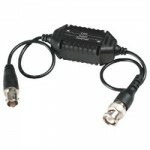 Since most wired security cameras have a BNC connector for video, and standard 12V DC power jack, you can use this one RG59 siamese cable to carry the video from the camera to the DVR recorder inside, and also use the power wire to carry electricity from the power adaptor (located inside next to the DVR ) back to the camera. We have siamese wire in both spools and premade cables. 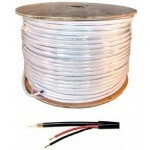 The different between any spool or premade cable is that the spool of wire has no connectors on it, making it easier for installations where you have to snake or fish the cable through walls. 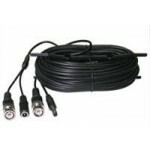 Of course you will also need to purchase two BNC connectors and two power pigtails for each camera that you will have to tip the cable and connect it to your camera's video and power connector. With premade cables, they are already cut to specific lengths such as 50ft or 100 feet, and have connectors on them already. So you just have to run the wire and tack it to the wall.